Keystone XL would transport 830,000 barrels a day of dirty tar sands oil from Canada's boreal forest through America's heartland. But that didn’t stop the Trump administration from illegally approving the cross-border permit for this horrendous pipeline last year. Now, the State Department is attempting to cover its bases by conducting an environmental assessment to evaluate only a few of the pipeline’s potential risks. But the facts are the same: The pipeline threatens our land, drinking water, endangered species, communities, and climate, and the permit is illegal. 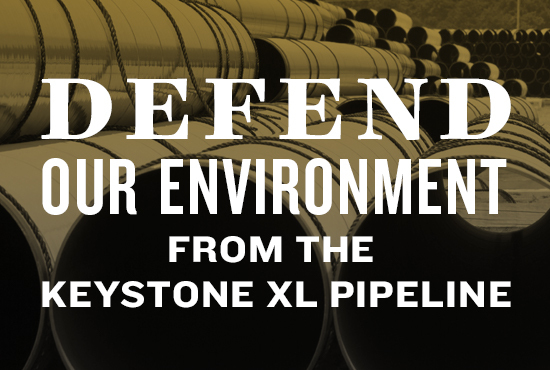 NRDC is already challenging the permit in court — but in the meantime, we need you to keep the pressure on the State Department to stop Keystone XL. Submit a public comment before June 25. Tell the State Department to protect our climate, land, drinking water, wildlife, and communities from the Keystone XL tar sands pipeline. Submit a public comment before June 25. Dear Sec. Pompeo and the State Department: I'm writing to express my opposition to the proposed Keystone XL pipeline. This pipeline would transport 830,000 barrels a day of dirty tar sands oil from Canada's boreal forest through America's heartland. I urge you to not just analyze the pipeline's new proposed route in Nebraska, but to carefully consider how it threatens our land, wildlife, drinking water, and the nation’s clean energy future, as well as the risks the pipeline poses to farmers, ranchers, indigenous people, and other communities along its route. Your approval of Keystone XL was based on a stale environmental review from 2014 and violated our nation's bedrock environmental laws. But even though you plan on conducting a new environmental assessment, the facts are still the same: The permit is still illegal, and the pipeline still threatens our environment and our health. I demand that the State Department, the Bureau of Land Management, and all other federal agencies deny any future permits for this project, and revoke the existing cross-border permit, immediately. Thank you for your time.